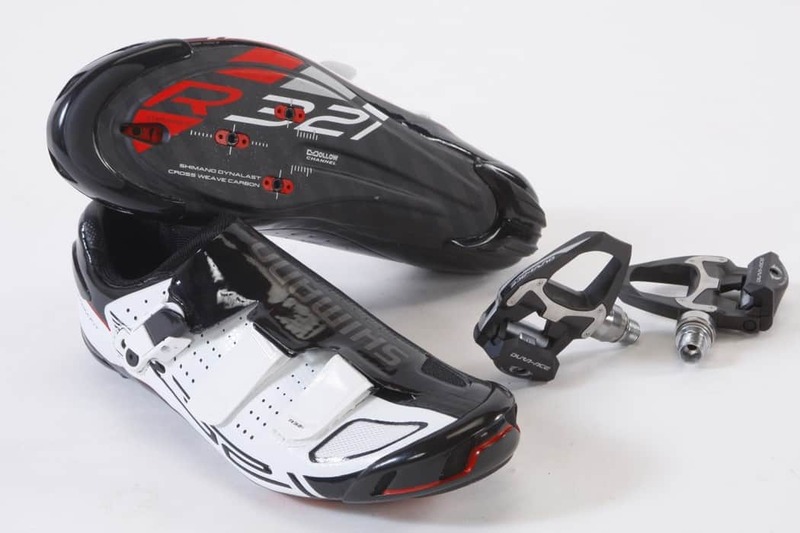 Shimano has been developing shoes and pedals for over 25 years, and they set the standard for mountain bike pedals with the SPD (Shimano Pedal Dynamics) all those years ago. Since their release, the SPD-SL has been a popular choice for road riders. 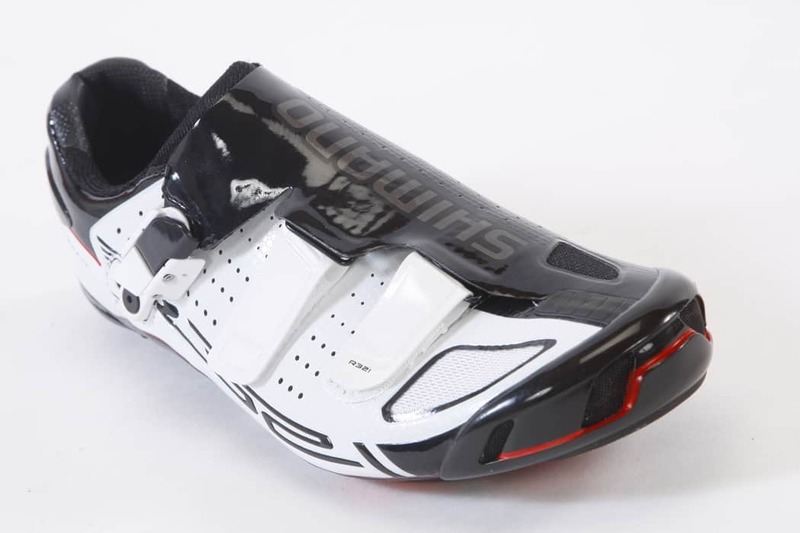 Along with the SPD-SL pedals, Shimano also supplies a range of road shoes that have innovative and advanced designs to provide the most comfortable ﬁ t possible yet still produce ample rigidity for power transfer. Back when they ﬁrst came about, Shimano Dura-Ace pedals matched the same SPD cleat and mechanisms as the original and still-current mountain bike design. Back then it was still a single-sided pedal but with the use of a metal cleat. Now, the SPD-SL uses a plastic cleat with rubber grippers to make for easier walking on pavement. The engagement and disengagement work similar to Look pedals, where the cleat hooks to the front of the pedal and snaps closed in the rear, while getting out is a simple ﬂick of the ankle to snap out. 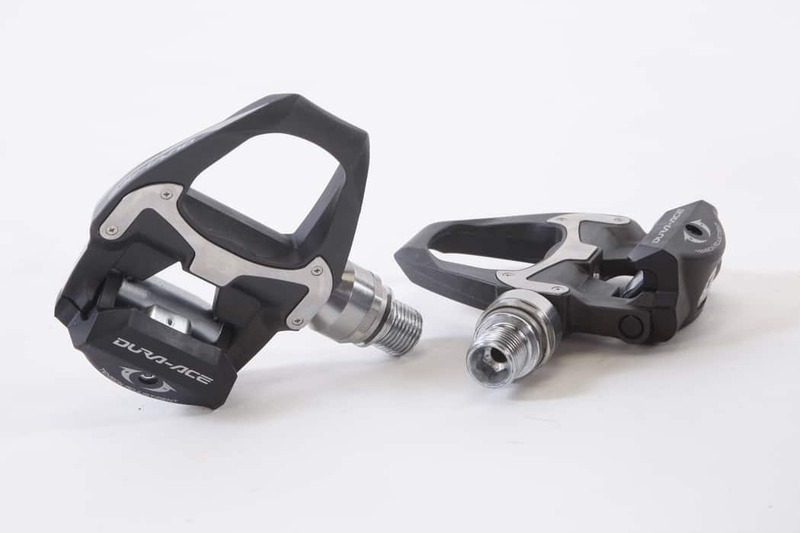 The newest iteration of the Dura-Ace pedal has an injection-molded carbon body and weighs 248 grams. 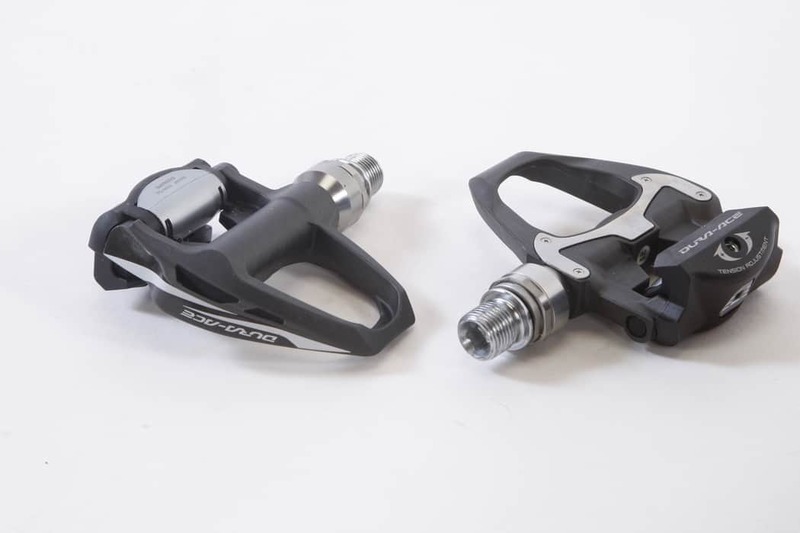 Along with the carbon-injected body, the Shimano Dura-Ace 9000 pedal also uses a stainless steel plate to reduce wear on the pedal from the cleat. An extra-wide 65mm platform provides optimal power transfer and extra width for added cleat stability on the pedal. Stable to its core, the Dura-Ace pedals use three widely spaced bearings for perfect load distribution over the width of the axle. Like all Shimano road pedals, the Dura-Ace pedals have a spring-tension adjustment. The spring is enclosed in the rear of the pedal to avoid being clogged by contaminants and best ensure consistent and reliable engagement. For those looking for a wider stance without bulky extensions, the Shimano cleat has ample lateral adjustment. The pedals also have a 4mm-longer axle option to widen your stance width even more. Like similar clipless pedal designs, the Shimano pedals use a front hook with an engagement claw on the aft of the pedal. Because the front hook is almost in line with the rest of the pedal body plane, you may have to toe down a bit more to engage the front of the cleat when compared to its competitors. When engaged there is minimal play between the cleat and pedal. Friction between the pedal and the cleat allow for a stable ﬂoat without slop. Due to the tight engagement, the connection between you and your bike can appear seamless, and then with just a ﬂick of the ankle you’re disengaged. Shoe development focuses on several factors, from comfort to stiffness to ﬁt to closure and material. Shimano, like most shoe manufacturers, searches for the balance between all the qualities to bring about their perfect shoe. The R321 is equipped with a hollow-channel carbon-weave sole for maximum stiffness and low weight. A wide vent near the toes allows adequate airﬂow through the shoe for comfort on those long, hot days. Shimano uses a highly adjustable sliding washer on the cleat to provide both maximum fore/aft and lateral positioning to hone in on the most nuanced ﬁt needs. Working our way up, Shimano uses a Custom-Fit insole for variable arch heights. The insole is also heat-moldable to provide a more personalized, custom ﬁt. Shimano’s Dynalast shape is designed for optimal power transfer, minimizing the stress and tension on muscles at the extreme points during a pedal stroke while also improving the recovery on the back end of the pedal stroke. The shoe’s upper is made of a synthetic-leather outer shell that wraps around the whole upper foot for a seamless feel. The heat-moldable Custom-Fit upper allows for a secure and comfortable ﬁt throughout the entire shoe from heel to toe. In addition to the toe vent, the shoe has small ventilation holes along the body to allow for even more airﬂow and comfort. Two lower Velcro straps at the bottom and one low-proﬁle ratchet strap enclose the shoe tightly, providing great security and efﬁciency moving through the pedal stroke. As personalized as shoes may be for ﬁt and shape, Shimano tries to minimize that variable with the aid of their Custom-Fit oven (found at participating dealers), which produces a heat-molded insole personalized for your foot. This is a feature that helps provide maximum comfort, especially on long days. The stiff sole adds to the shoe’s efﬁciency while contributing extra comfort with the stable shoe. Custom-ﬁt insoles make it simple to change the support for your arch height without needing to purchase a new insole for the shoe. The R321 ﬁts fairly wide in its normal size; for most riders that search for a wide shoe, this is deﬁnitely one to consider. Ratchet enclosure systems are a bit out of date, but Shimano continuously improves upon them to make them feel and ﬁt increasingly well. With so many vents around the entire shoe, lack of airﬂow was never a problem. The modular adjustability of this shoe makes it a great ﬁt for most riders, but we would still strongly suggest to visit your local bike shop and try them on. 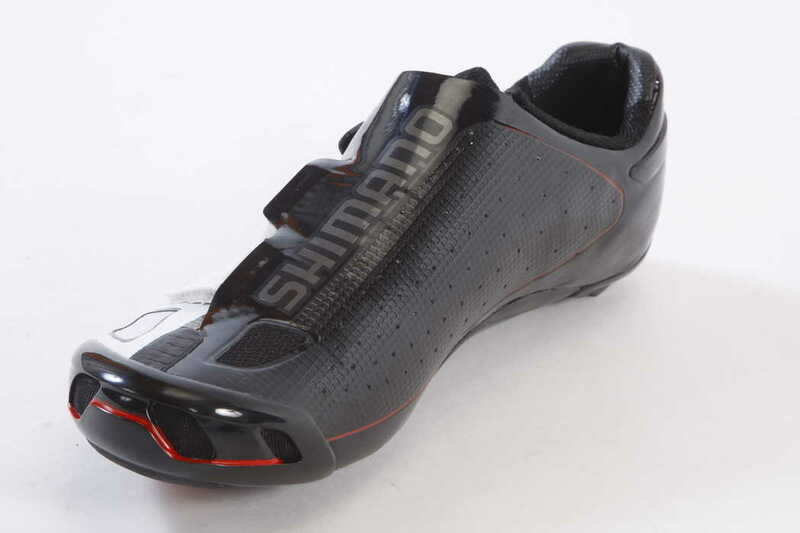 It is no doubt that Shimano makes a great shoe and pedal. Stable and durable platforms at both ends, Shimano strives for all-day comfort and can stand up to day-in-and-day-out abuse. The connection between the R321 shoe and Dura-Ace 9000 pedal is unmatched, and the stiffness is everything that you could ever want in a pedal-and-shoe combo. The combination of the Custom-Fit heat-moldable insole and upper, along with the stable, no-play feel of the pedals, has us sold on this shoe.